Patented process for the production of nodular graphite cast iron. 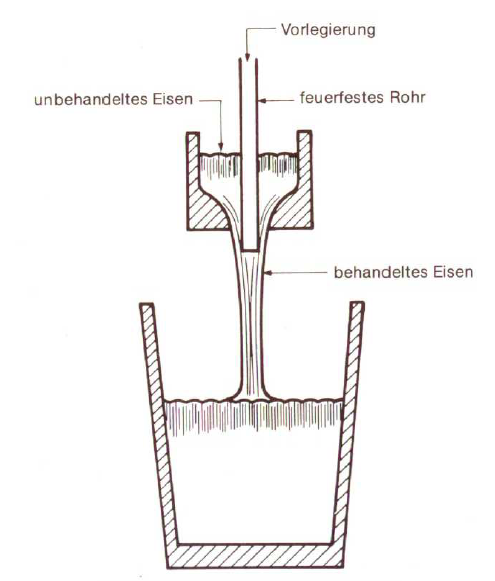 As shown on figure 1, the magnesium master alloy is introduced into the center of a jet flowing out of a pouring basin between unprocessed iron and the ladle. The magnesium reaction takes place in the iron jet; it stops as soon as the iron jet hits the bath surface of the pouring or transport ladle. Inoculation can be carried by pouring the melt into another vessel or after the magnesium treatment using the same fixture.